Paul Ryan and Ayn Rand: Why don’t America liberals have their own canon of writers and thinkers? Why Is There No Liberal Ayn Rand? American conservatives have a canon. Why don’t American liberals? 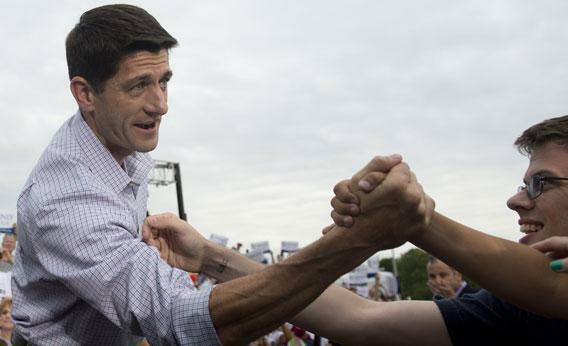 Paul Ryan greets supporters at a campaign stop. Ryan has been known to the cite the works of Ayn Rand. How come liberals don’t have their own canon of must-read literary works? We tend to think of the conservative influence in purely political terms: electing Ronald Reagan in 1980, picking away at Social Security, reducing taxes for the wealthy. But one of the movement’s most lasting successes has been in developing a common intellectual heritage. Any self-respecting young conservative knows the names you’re supposed to spout: Hayek, Rand, Ludwig von Mises, Albert Jay Nock. There are some older thinkers too—Edmund Burke, for instance—but for the most part the favored thinkers come out of the movement’s mid-20th century origins in opposition to Soviet communism and the New Deal. Once upon a time, the Old Left had “movement culture” par excellence: to be considered a serious activist, you had to read Marx and Lenin until your eyes bled. For better or worse, that never resulted in much electoral power (nor was it intended to) and within a few decades became the hallmark of pedantry rather than intellectual vitality. The New Left reinvented that heritage in the 1960s. Instead of (or in addition to) Marx and Lenin, activists began to read Herbert Marcuse, C. Wright Mills, and Saul Alinsky. As new, more particular movements developed, the reading list grew to include feminists, African-Americans, and other traditionally excluded groups. This vastly enhanced the range of voices in the public sphere—one of the truly great revolutions in American intellectual politics. But it did little to create a single coherent language through which to maintain common cause. Instead, the left ended up with multiple “movement cultures,” most of them more focused on issue-oriented activism than on a common set of ideas. Liberals have channeled their energies even more narrowly over the past half-century, tending to prefer policy tweaks and electoral mapping to big-picture thinking. When was the last time you saw a prominent liberal politician ascribe his or her passion and interest in politics to, of all things, a book? The most dogged insistence on the influence of Obama’s early reading has come from his Tea Party critics, who fume constantly that he is about to carry out a secret plan laid out a half century ago by far-left writers ranging from Alinsky, the granddaddy of “community organizing,” to social reformer Frances Fox Piven. Liberals may argue that they are better off knocking on doors and brainstorming policy than muddling through the great works of midcentury America. “Americans usually reject the party of theory,” E.J. Dionne wrote in Sunday’s Washington Post, responding to Ryan’s nomination, “which is what conservatism has now become.” The problem is that most liberals couldn’t put together the sort of intellectual short list that conservatives now take for granted even if they wanted to. In my Yale seminar on liberalism and conservatism, I try to assign some plausible candidates: Arthur Schlesinger, Reinhold Niebuhr, Betty Friedan, Michael Harrington, Martin Luther King, John Kenneth Galbraith. Undoubtedly many people reading this essay can come up with alternatives, and register strong objections to any of the above. But liberals rarely ever have the conversation. Putting together the conservative side of the syllabus is always vastly easier than putting together the liberal one, in part because conservatives themselves have put so much time and energy into the selection process. Some of this imbalance is due to the relative weakness of the current American left. Liberals are not the logical counterweight to conservatives; leftists are, but they are few in number. Still, we have the political spectrum that we have, and liberals fail to take up the intellectual challenge at their peril. Conventional wisdom suggests that Romney may have doomed his electoral bid by choosing an ideologue—one who likes to go on about Ayn Rand!—as his vice presidential nominee. Yet it seems equally possible that Ryan’s nomination will do just what Romney wants: mobilize a base of committed activists who share most of Ryan’s basic ideas. The default mode for liberals and progressives in such situations has often been to celebrate “diversity”—intellectual, racial, sexual, and of most other sorts. In many ways this is for the best. Nobody wants to return to an era in which politics and political ideas were dominated by a handful of white men, however thoughtful. Yet we rarely pause to consider what liberals have lost by neglecting a common intellectual heritage and by attempting to win political success without a political canon. At its best, a canon helps people put the pieces together, offering long-term goals and visions that sustain movements through periods of trial and defeat. Without those visions, liberals have no coherent way of explaining where we’re headed, or of measuring how far we’ve come.